Ian Ginoza wears a Romanelli jacket carried at the new Ward Centre boutique. BEFORE HITTING his teen years in the late '80s, Ian Masaki Ginoza was already picky about footwear. "I was young, 12, 14. I knew what I was looking for wasn't offered in Hawaii. My parents would take me on trips every summer, so I would save my money and wait until we went to Los Angeles or San Francisco. "What I was buying at the time were Air Jordans. Those were $100, and I don't know how I did it. I'd do all kinds of things, starting with saving my allowance. "To me, this is not just business for the sake of running a business. This is just life. If I didn't do this, I don't know what I would do." "Sometimes by parents would kick it down to me. One time they bought me a pair of Jordans for basketball, but I didn't want to run in 'em coz I'd mess 'em up." These days, Ginoza and Kicks Hawaii business partners Eddy Haus and David Lin search the globe for the freshest footwear to bring back home, thus saving other sneaker freaks from the trauma of wearing anything less than shoes with that magical combination of quality, comfort and street cred, plus eye-catching exclusivity and good looks. What started as a niche boutique for sneakerheads quickly revealed an untapped market for rare, classic retro and contemporary athletic and urban footwear that the trio were well aware of. This is, after all, no mere business to them. "I've lived this my entire life," says Ginoza. "To me, this is not just business for the sake of running a business. This is just life. If I didn't do this, I don't know what I would do." Members of the Kicks Hawaii crew include Blaise Sato, left, manager Chris Kam, and co-owner Ian Ginoza, fronting a display of men's and women's footwear. When the first Kicks opened in November 2001 at Makaloa Plaza, Ginoza said, "the response was immediate. Basically, what we did was provide what people wanted. The demand was there and it seemed obvious to me." With the new year comes a second Kicks Hawaii at Ward Centre, in the new row of shops fronting Auahi Street. The new shop follows the company's successful opening of another shoe boutique, St. Alfred, in Chicago four months ago. Although Kicks Hawaii still serves a hard-core niche of shoe aficionados, it's just a matter of time before the trend, currently straddling the music, sports and indie fashion worlds, takes the mainstream by storm. There have already been collaborations between Gwen Stefani and Royal Elastics, Marc Jacobs and Vans, Kenzo Minami and Reebok, and John Varvatos and Converse. Kicks has branched out into clothing as well, carrying boutique lines from New York, California and Australia, and sharing valuable floor space with increasing numbers of young local designers. Plenty of kicks in store. IF WOMEN HAVE been known to indulge a peculiar penchant for collecting strappy sandals, luxe pumps and stilettos, all with the same basic shape but different in their ever-changing array of details, details, details, it seems some guys are just as vulnerable to the siren song of shoes, applying their love and memory for sports stats to seasons and styles. Kicks Hawaii manager Chris Kam (no relation to this writer) said it's not unusual for a Kicks customer to own more than 30 pairs of sneakers and stop in a couple of times a week to check out what's new on the shelves or on the company's Web site (www.kickshawaii.com) -- like Nike Air Force 1s shaped from ostrich and snake skin, at about $140, or Dunks with urban camouflage patterns and prints laser-etched into rubber trim, for $100. "Within brands there are levels of availability, and we have access to a lot of styles unavailable to other stores," Kam said. "People in Hawaii don't really notice them when I'm walking around, but in L.A. or San Diego, anywhere in the country, lots of kids are into it so they stop me on the street to ask about them," he said. He typically adds their names to the company's e-mail newsletter that keeps fans informed about new offerings. THE ENTREPRENEURIAL streak that Ginoza tapped as a teen to raise money for shoes grew while he was working as a graphic designer for an advertising and marketing company in San Francisco, later branching out to focus on work with skateboarding companies. "I was design director for Ipath, a skate/sneaker company in San Francisco, and working with them was a big lesson. It was a good time in my life, but I wanted to move back home and I knew there was not too much work for designers in Hawaii. I got together with Eddy, and we decided to do our own boutique." 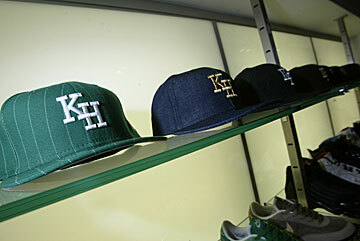 With the contacts Ginoza had made at companies like Nike and Adidas, he was able to develop exclusive, limited-edition designs for Kicks Hawaii. "From Nike's standpoint, we don't sell tons of units like a Footlocker, but what we're able to offer is an image," Ginoza said. "A lot has to do with skateboarding culture, music, our whole lifestyle. For me, this is natural." In spite of his passion for shoes, Ginoza says he's never been a collector and always tossed his shoes out when they became too old and ugly to be seen. Now that a pristine pair of first-edition Jordans can fetch more than $3,000, Ginoza says, "I look at 'em and I wish I'd kept mine."